My friend was planning to start his 37th year with a proper feast at his favorite restaurant, Old Krakow. Before the call, I was trying to decide what to do with a few random ingredients that were taking up space in my small kitchen: some spotted bananas, some milk chocolate, a bag of toasted hazelnuts, a block of cream cheese. After the call, I pulled out my cake pans and began baking. 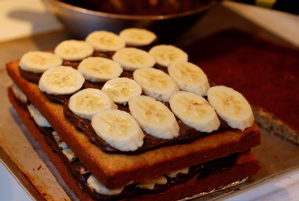 Bob’s Chocolate Banana Birthday Cake included layers of moist banana cake, chocolate ganache filling, sliced fresh bananas, cream cheese frosting and toasted hazelnuts. Bake the batter in a large sheet pan rather than regular layer pans. With only 1 inch of batter, the cake bakes in 15 minutes. Cutting it crosswise into three or four strips makes easily stacked, easily frosted layers that form a distinctive rectangular cake. Prop the cake in a wide-open window. Ten minutes in SF’s cold summer wind was enough to cool the cake completely. Cream cheese frosting is simple to make, a breeze to spread and holds up well over a couple of hours or a couple of days. The hair-dryer trick comes in good use here, too. Use a soup spoon to make attractive swirls on top of the cake. 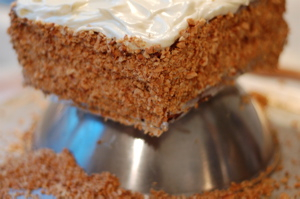 Pressing finely chopped nuts onto the sides on the cake is an easy way to finish the cake while hiding a fast frosting job. Dab a spot of frosting on the platter before placing the first layer down. It will act as â€œglueâ€ to keep the cake from sliding right off the platter and onto the floor of the car. Place the cake on an upturned bowl or pot to frost the cake. I reinforced the bottom of the cake with a piece of cardboard wrapped in foil. Setting the cake over a tray while coating with a glaze or with nuts allows me to catch and reuse overflow. Although I was a few minutes late, I scored a parking space right in front of the restaurant and arrived before the drink orders were even taken. The folks at Old Krakow were gracious enough to chill the cake for us while we lingered over dinner. This restaurant is the one reason I make my way out to West Portal. Its quiet dining room is a rarity unto itself, but sitting at a real dining room table, with comfortable chairs and the full complement of inserts, always makes me feel like I’m enjoying a special meal at someone’s home. The friendly, unhurried service helps settle me into a leisurely meal. The best thing, of course, is the food itself. Garlic soup: so simple, so satisfying. I always succumb to an entree — usually the breaded pork chops — but I’m pretty sure I could enjoy an entire meal of just soup and my own plate of pierogi. Order the borscht if you must. However, the mushroom soup is paradise in a spoon, while the garlic soup’s simplicity hides an incredibly fulfilling, flavorful broth. 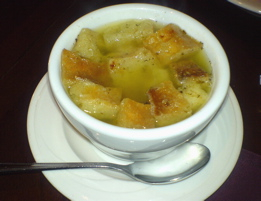 Pickle soup doesn’t appear on the menu, so be sure to ask your server; it’s a must try for anyone who likes a hint of tartness with their savory. If you’re with a larger party, you must try the full range of appetizers, from pickled herring and beef tartar to beet salad and marinated mushrooms. Keep in mind that portions are large. There’s a â€œlighter fare and sidesâ€ section of the menu, but all things being relative, potato dumplings and kielbasa are lumped in there with mushroom crepes and sauteed cabbage. The kitchen is also happy to split entrees. Our favorites for the evening were the stew, the stuffed cabbage, the duck and — of course — the breaded pork chops. 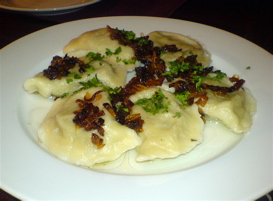 A plate of mushroom-filled pierogi topped with perfectly caramelized onions. Our servers cut and plated the chocolate banana cake tableside for our party. Someone in the kitchen had even piped out â€œHappy Birthday!â€ on the top in chocolate for the guest of honor. If you’ve never tried Polish food, this is certainly the place to experience an Old World meal. Old Krakow lends itself well to celebrating special occasions with a comfortable, casual feel. Don’t mind their totally amateur website; it’s proof that you’ll get good home-cooking, not slick style.